Home / Medal Framing / Medal Framing. We are currently involved in various Medal Framing. 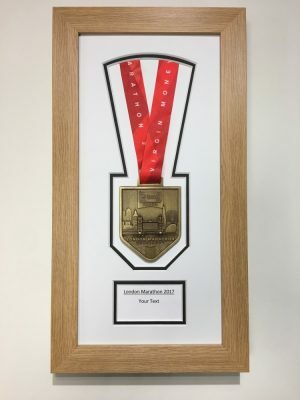 We have just created a range of bespoke items for the @LondonMarathon 2017 for displaying Medals, Race Numbers and Photos etc. These are available in our showroom and online. We are also working closely with @LancsPolice on framing memorabilia of retiring officers. We have kindly been given permission to show this one on our site. Thank you. We will soon be launching a new range for the Triathlon and IronMan markets in this ever increasing popular sport. We believe these items of achievement should be displayed and are keen to create range of stunning yet affordable options.